To me there is something powerful about ‘whitening’ a chunk of personal narrative. I’m not sure why. It may have to do with aging away from drama. It may speak to the non-linear qualities of memories – how they can be rearranged, fragmented, or removed from the frame altogether. Or, it could be that the ordinary domestic process of stitching fragmented stories back together reenacts a healing process. All that may be so, but right now, the power lies elsewhere. 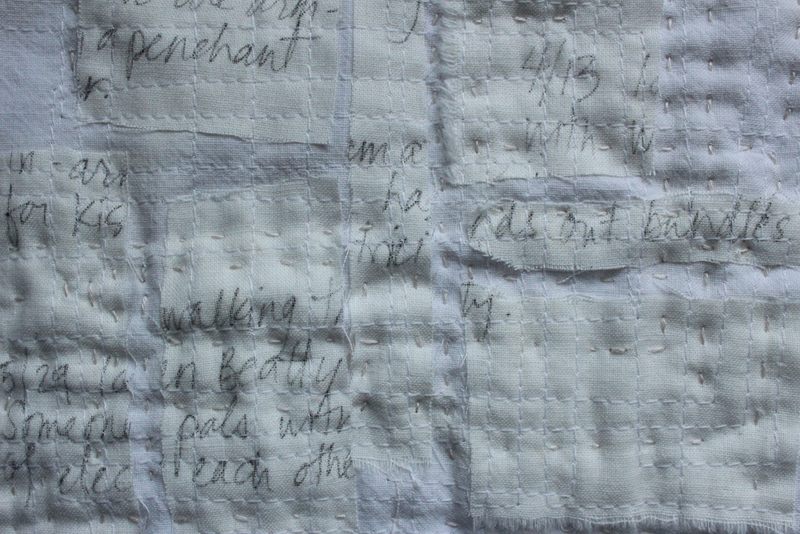 Working with fragments of a life (my life) in a manner truly lacking any ‘charge’ (in fact, in a process akin to mindless doodling) gives me a kind of casual dominion over these journal entries. I’m not studying them. I’m not trying to read them forward or backward. They are just there. They are just there in a way that I might like to just be here. I am not sure I am making any sense. Or whether this is even a good thing. And here are a few practice notes. 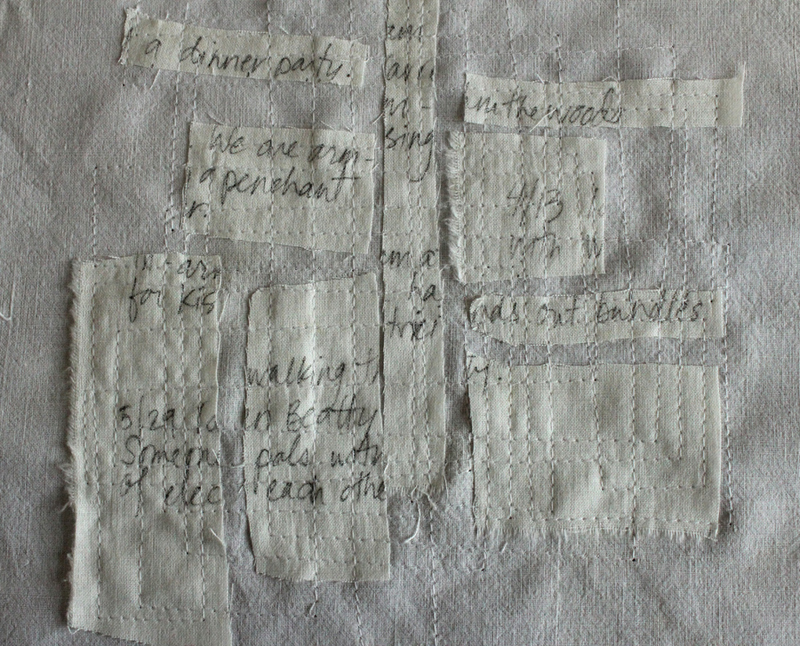 Using a Pitt pen, I scribed seven dreams from a 1992 journal onto two pieces of nicely pressed muslin — one swatch bleached, one swatch unbleached. Unlike the last time I used scribed strips, this time, I wanted at least some of the phrases to be legible. 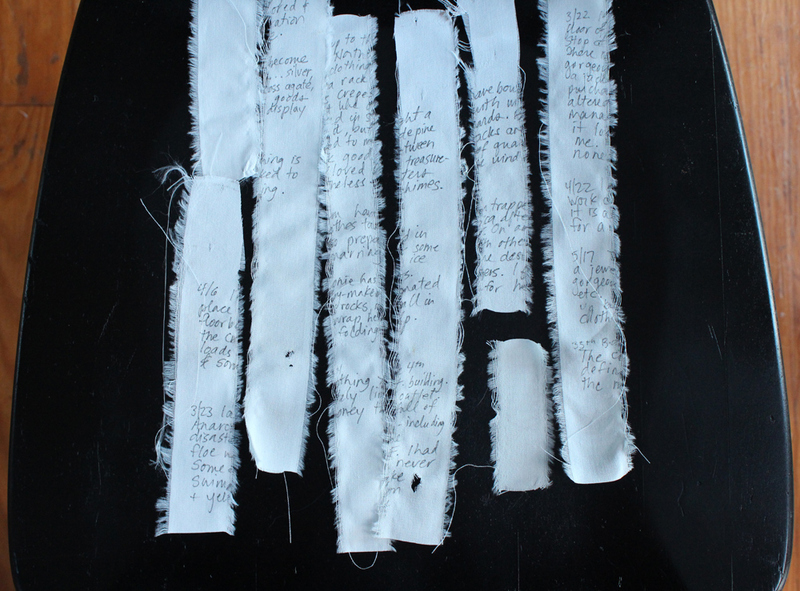 The five dreams were composed into a vertical piece (with no batting) and two other dreams were composed into a square piece (with the traditional three layers of top/batting/backing). 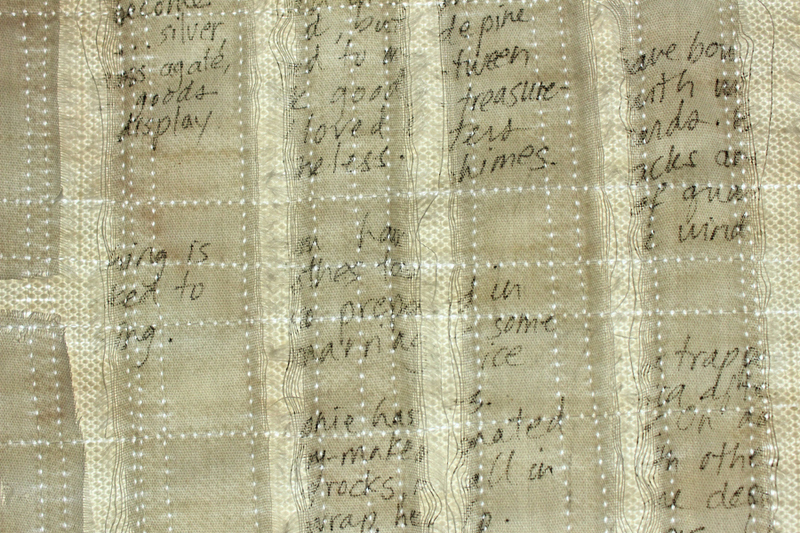 First, I applied a grid of machine stitches to adhere the muslin in place. Stitch, stitch, stop at an end, pivot the needle, travel a short distance to beginning of next row, and stitch, stitch, stitch a parallel line. Foot up. Foot down. Clap. Clap. Some variations were generated when introducing the perpendicular grid. Pivot. Foot down. Foot up, pivot. Rhythmic machine stitching in front of a window, alone in the house. Then I stitched by hand. White thread, or off-white thread. 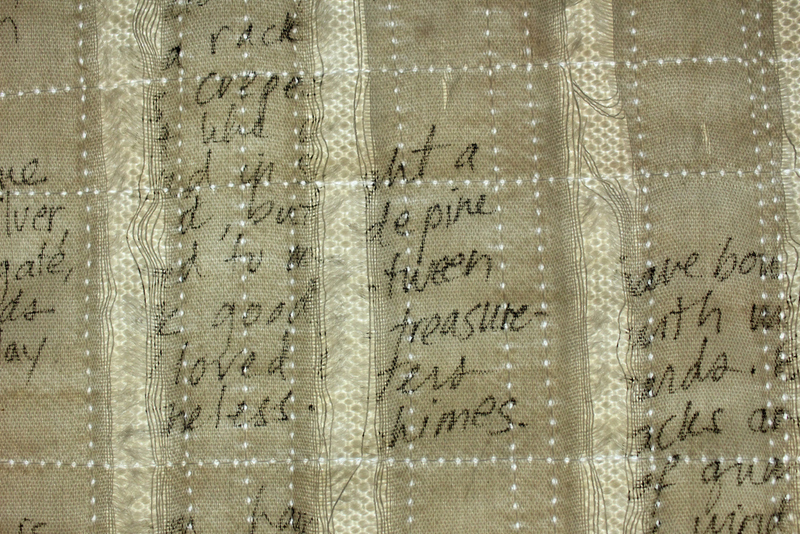 I had some loose rules as I did both of these things (tracking lines in parallel, avoiding stitching over a penned letter, stitching out bumps) which enhanced the relaxed approach, as few decisions were required. I’m almost done with the square one. 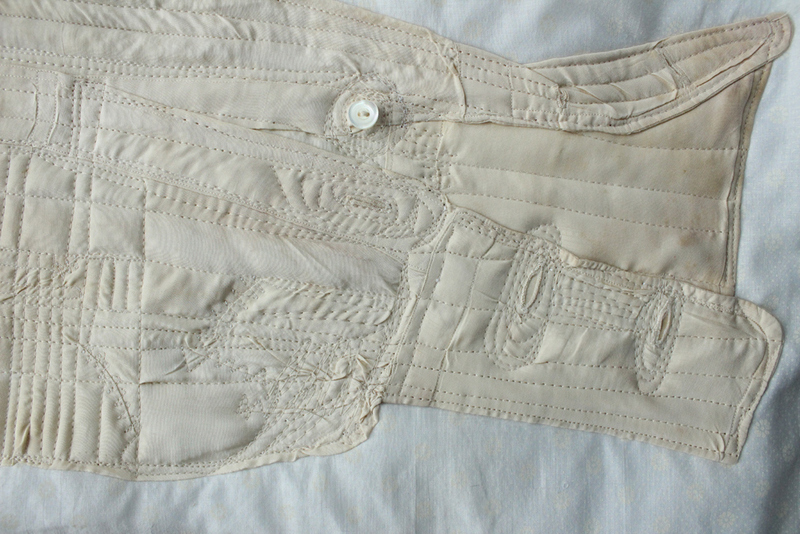 The vertical waits for hand-stitching. 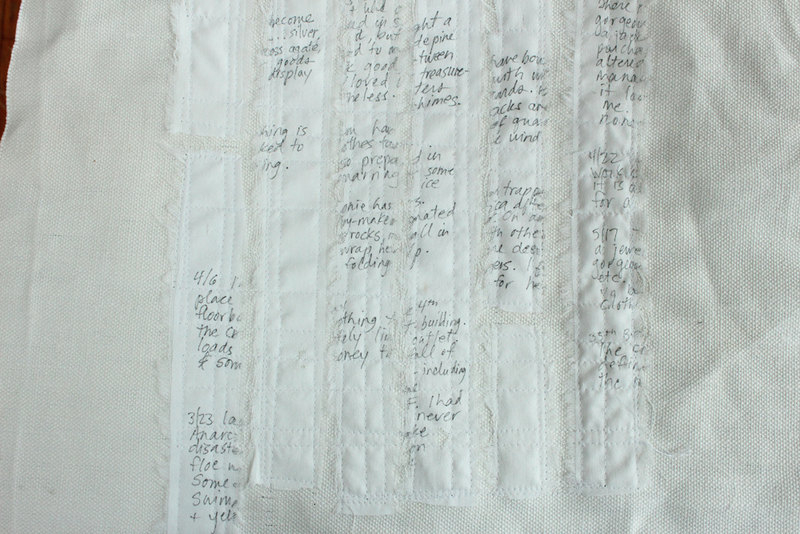 Lastly, here is a teaser — this also was stitched this week. I am using a similar process on this antique silk Japanese sleeve (more on it later). This entry was posted in online learning, script quilts and tagged "dee mallon", "fiber art", cloth strips, dream, dream journal, grid, online learning, script, stitched grids, whitening on March 28, 2013 by deemallon.